Israel remembers its friends, and has no better friend than Paraguay, Prime Minister Benjamin Netanyahu said Monday at the opening of the country’s embassy in Jerusalem. 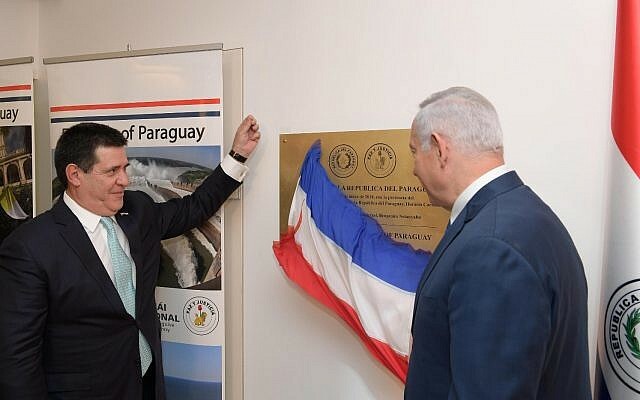 Paraguayan President Horacio Cartes, who arrived in Israel Sunday evening, opened the embassy along with Netanyahu in the Malha Technological Park, in the same building where Guatemala opened its embassy in the capital last week. The US transferred its embassy to its consular section building in Jerusalem’s Arnona neighborhood last Monday. “It was an act of benevolence and mercy that was forever engraved in our hearts,” he said. Netanyahu also recalled that Paraguay supported the establishment of Israel during the partition vote in the UN in 1947. “Paraguay, before but especially under your leadership, took a very bold stance in international affairs and refused to cooperate with the lies directed against Israel,” Netanyahu said. The Palestinian Authority angrily denounced the move, with the PA Foreign Ministry issuing a statement calling it a blatant act of aggression against the Palestinian people and their rights, a scandalous violation of relevant UN resolutions and international law, and the result of American-Israeli dictates and enticement. Cartes was the first Paraguayan leader to visit Israel, when he came here in 2016. A year later he traveled to Buenos Aires to meet Netanyahu, who was visiting Argentina on the first ever visit by a serving Israeli prime minister to Latin America. Cartes, whose five-year term ends in August, was elected in 2013 with a campaign team that included a group of Israeli advisers, including Netanyahu’s former bureau chief Ari Harow.